We show that Abenomics ended deflation in 2013 and raised long-run inflation expectations. Our estimates suggest that Abenomics also raised 2013 output growth by 0.9 to 1.7 percentage points. Monetary policy alone accounted for up to a percentage point of growth, largely through positive effects on consumption. They see Abenomics’ success coming from its commitment to a new monetary regime, one that credibly moves Japan away from its deflationary past. Like others, they compare Abenomics to FDR’s regime change in 1933, but acknowledge it has not proportionally packed as much of a punch. The authors attribute this difference to the relatively small size of Abenomics as well as the Bank of Japan lacking full credibility on its new inflation target. They see the lack of full credibility as a consequence of its monetary history and demographics (i.e. pensioners hate inflation). [NGDP level targeting] would create an expectation that some portion of the monetary base growth from the asset purchases would be permanent (and non-sterilized by IOER). That, in turn, would mean a permanently higher price level and nominal income in the future. Such knowledge would cause current investors to rebalance their portfolios away from highly liquid, low-yielding assets towards less liquid, higher yielding assets. The portfolio rebalancing, in turn, would raise asset prices, lower risk premiums, increase financial intermediation, spur more investment spending, and ultimately catalyze a robust recovery in aggregate demand. While our views may be complimentary, I do think something is lost by focusing too narrowly on the New Keynesian channel. The portfolio rebalancing process I outline above is effectively the same thing as a reduction in the excess demand for money. And excess money demand–broadly defined to include both retail and institutional money assets–in my view is the deeper reason for the slump of the past five years. A permanent, unsterilized injection of the monetary base would have gone a long way in solving this problem. Prevalent thinking about liquidity traps, however, suggests that the perfect substitutability of money and bonds at a zero short-term nominal interest rate renders open-market operations in- effective as a stabilization tool…Yet, our analysis shows… that credibly permanent open- market operations will be beneficial as a stabilization tool as well, even when the economy is expected to remain mired in a liquidity trap for some time. That is, under the same conditions on interest rates that make open- market operations attractive for fiscal purposes, a monetary expansion that markets perceive to be permanent will affect prices and, in the absence of fully flexible prices, output as well…Our analysis suggests that Japanese policymakers should underscore the permanence of past operations, perhaps through an announced inflation target range including positive rates, and may need to increase the monetary base even more. That last sentence is striking. It is call for Abenomics almost a decade before it was adopted. It would have been nice to seen a discussion of it in the Hausman and Wieland paper. Still, the paper overall is a good read and worth your time. Give it a look. 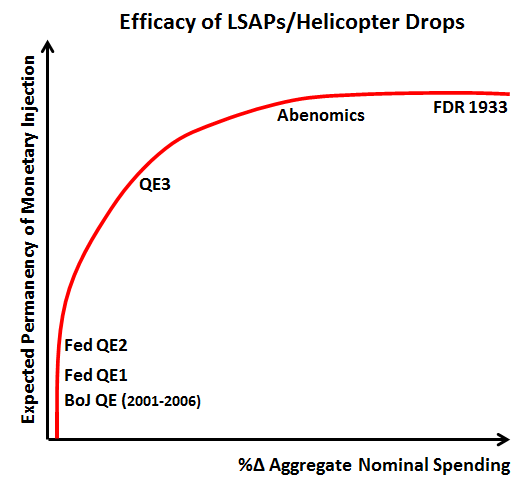 Addendum: Milton Friedman would probably be happy with Abenomics.